It would seem that the Blu-Ray format has been moving quite swiftly down the road to ubiquity. The players themselves have grown quite common lately as prices have come down from the shamefully high levels inherent to any new technology. The real milestone of note, however, is the increasing availability of Blu-Ray writers for the average computer owner. Since the downfall of the competing HD-DVD format, tech companies have been abandoning their seats on the fence and landing squarely in the victor’s camp. 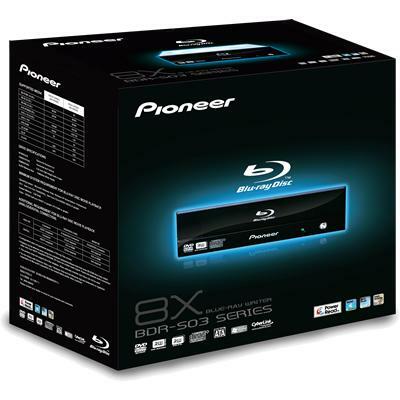 Pioneer has offered up its easily affordable BDR-S03XLB internal Blu-Ray recorder. With a price tag well under 200 pounds, it makes for a simple upgrade to your computer. While it understandably requires a bit more power than a plain CD-R drive, its system requirements of 1.8 GHz processor power and 1 GB of RAM mean that you won’t need a supercharged powerhouse of a PC to use the BDR-S03XLB. Its SATA interface provides speedy transfer rates and an easy installation of the hardware. The BDR-S03XLB runs on Windows XP as well as Vista, so you’re unlikely to run into compatibility problems there. It also comes bundled with Cyberlink writing software with which to get started. As far as I can see, the sole drawback of a Blu-Ray writer is not an inherent fault but a personal lack of the frequent need to burn a whopping 25 or 50 GB disc. This might seem to limit Blu-Ray recorders to a niche market, but with its admirable specs Pioneer’s BDR-S03XLB is also fully capable of replacing whatever optical drive you might already be using. It writes standard and Dual-layer DVDs at 16x and 8x respectively, as well as boasting a 32x CD-R write speed.